This is the second of my party food posts from the weekend! First I posted a yummy Tenderstem Broccoli and Sundreid Tomato Quiche which formed part of our buffet dinner. Today I’m sharing one of the puddings, my lemon and amaretti cheesecake! Lemon cheesecakes are perhaps my favourite cheesecakes because the acidity beautifully cuts through the rich creaminess of the cheese, but a simple lemon cheesecake is not enough, I had to jazz it up a little more. Amaretti biscuits seemed to me the perfect addition to a lemon cheesecake. Amaretti is Italian for ‘little bitter things’ as they are small round biscuits made from almonds, egg and sugar, with a texture not dissimilar to macaroons and have a bitter taste. It was this bitterness that I believed would give a well rounded flavour to the cheesecake. By using amaretti biscuits you can turn a nice cheesecake into an exciting, luxurious cheesecake that your guests won’t be able to stop talking about! Enjoy! First of all grease the bottom of a large spring form tin. 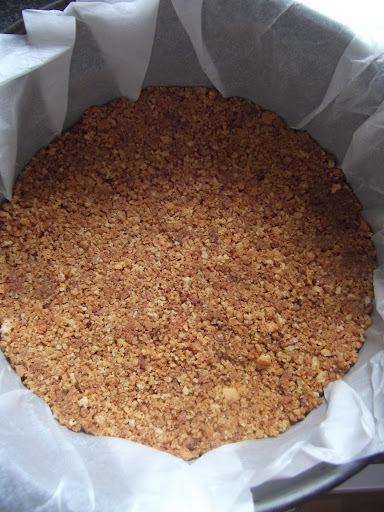 Mix the melted butter and crushed biscuits in a large bowl then press firmly into the base of the tin. It should form a layer about 1inch thick. Place this into the fridge to set for 5mins while preparing the cheesecake mix. In another bowl mix the mascarpone, cream, sugar and the juice of the lemon. Once fully combined spread a thin layer over the biscuit base; next spread a thick layer of lemon curd over the cheesecake layer, leaving a centimetre around the edge free. Finally, add the rest of the cheesecake mix to the tin, covering the lemon curd – this way there will be a lovely lemony surprise at the bottom! 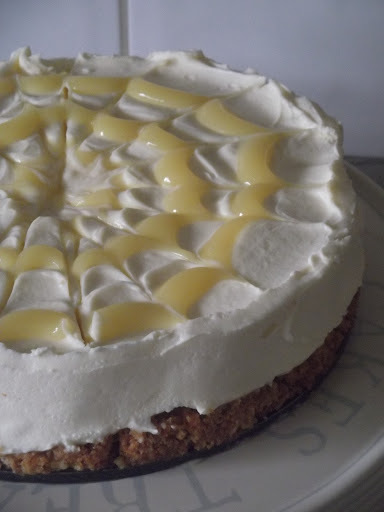 To decorate, pipe rings of the lemon curd on to the flat top of the cheesecake then, using a skewer, score the top of the cheesecake starting from the centre working outwards to form an almost spider web like patter. Place back in the fridge for at least 5 minutes, until you are ready to serve. This sounds incredible! I love amaretti in the base of a cheesecake. In fact, the base is always my favourite part because I'm so crazy about biscuits, but the lemon part looks pretty amazing too! What size cake tin do you use for this cheesecake? what size tin did you use for this cheesecake?